In order to study the effect of basketball athletes on the action of fast stop jump after fatigue, the dynamic characteristics of lower limbs during the rapid stop jump shot under fatigue were discussed by means of experimental analysis in this paper. 12 basketball professional athletes in a sports institute were selected. Fatigue test was conducted with continuous running and jump. A special motion capture and mechanical three-dimensional tester was used to collect the kinetic data of the subjects. The results show that the indexes of the athletes in the take-off stage, the flying stage and the landing stage have significant differences before and after fatigue. After the fatigue of the athletes, the ankle augmentation rate decreases, so the dynamics characteristics weaken. Because of the great internal and external shock of the ankle joint before landing, the risk of injury is relatively large. After fatigue, it is suggested that the basketball players reduce the knee joint torque and the lower limb gravity, which may reduce the risk of injury. The sport event that a basketball player is engaged in is considered as a group project in the field of kinematics. Because of its complexity, athletes are more confrontational in the process of competition. Therefore, in such a relatively large load of economic environment, basketball players are often in a state of fatigue, and are likely to suffer from occupational diseases . According to the professional pathological investigation data after the match, the fatigue injury time of the basketball players is usually in the last section. This is because at the end of the game, the activities of basketball are in a period of reduced physical fitness, and the chances of fatigue injury are greatly increased. The intense basketball competition has great impact on the physical and psychological impact of athletes. The proportion of fatigue damage accounted for 53% of the other injuries, and the daily training ratio was 27%. Therefore, besides the required competition, the basketball players should also carry out daily basic training . The stop motion control ability and movement pattern of basketball players are highly demanded. Bone, muscle and nerve reaction system of athletes are more sensitive to fatigue damage. The kinematic parameters of the lower limb of the human body are affected by the fatigue of the joints, and the joints tend to become more relaxed. It is difficult for the athletes to find such fatigue damage during the competition. In the literature reports, most of the discussion is about the movement patterns of the athletes' fatigue damage. The mechanism of the local muscle movements of the basketball players is analysed, but many studies are still limited. The technical movement specification that can be analysed to the ground after the take-off stage, and it does not involve the analysis of special technical movements . This study aims at the professional technical actions of basketball players who do stop jump shot after the fatigue, which is close to the actual competitive state. It can provide data support for the athletes' training and competition in the future. Basketball players have a feeling of tiredness in the competitive state. However, it is easy for athletes to ignore the fatigue discomfort in the fierce confrontation. Therefore, fatigue damage has a slow development process. Once more than the body's damage, fatigue tolerance accelerates the rate of damage . When impact accelerations and loads are excessive relative to the strength of the tissue, they may cause a number of musculoskeletal overuse injuries, including stress fractures , osteoarthritis , and articular cartilage and joint degeneration [6,7]. Given that the body attempts to attenuate such impact accelerations using various neuro-muscular and joint kinematic control strategies , there is a potential to increase the risk of injury when the neuromuscular system is fatigued [9,10]. For basketball athletes, the ability of running and jumping of lower limbs is very important. A good footwork is required for an athlete's change direction, turn around, and basic defensive movements. Without excellent athletic ability, the basic movements of basketball are incomplete. In the actual competitive process, the mechanism of the movement pattern of the lower limb is not clear. As a result, fatigue damage continues to occur, but controllable methods are not supported by scientific theories . How to save the physical strength of athletes to play the best competitive state, and how to reduce the amount of physical energy consumption, are the scientific research topics in the future planning and construction of the field of basketball kinematics. This research inherits the basic achievements of previous studies. On this basis, the author makes the analysis of the technical movement and the kinematics characteristics of the stop jump shot of basketball, and analyses the corresponding relationship between damage and fatigue. It is hoped that the research conclusions and data can provide a theoretical basis for the formulation of a better plan for basketball physical fitness training . The research content of this paper is the construction and research of the stop run jump fatigue model of the exhibition basketball players. The kinetic characteristics of fatigue before and after the jump stop movement are collected to measure and analyse the kinetic data of knee joint angle after fatigue damage and moment, so as to provide help for the basketball competition and training injury prevention (Figure 1). Figure 1: Basketball jump shot technical action shows the effect diagram. The subjects selected were 12 basketball professional athletes at a sports university. The level of athletes was the national second class athletes. Before the experiment, the subjects were screened to ensure that athletes did not undergo training or strenuous exercise within 24 h before the experiment, and there was no obvious occupational injury in the lower limbs for 6 months. Table 1 shows the basic information for the subjects. They were about 20 y old, the height was about 180 cm and the weight average was about 75 kg. The training time for basketball was about 5 y. Table 1. The basic information of the object of study (n=12). Aiming at the kinematics data acquisition of athletes during the experiment, the MAR infrared high-speed information capturing and collecting system was used. The upper bound data acquisition frequency was about 200 HZ. The force of the lower limb was indirectly obtained by measuring the reaction force of the ground. By using a dedicated force measuring device, the limit frequency of data acquisition was 1000 HZ. The basketball box used during the experiment was the basket used in the CBA league, and the basket used in the League was highly consistent with the height of the actual event. Figure 2 shows the basket used for the test. 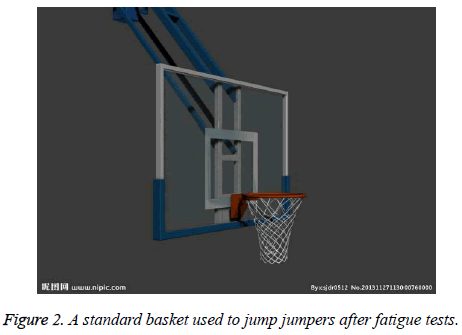 Figure 2: A standard basket used to jump jumpers after fatigue tests. The model of kinematic fatigue was modeled according to the acquired data. Chappell model was used to analyse the effect of lower limb fatigue on the performance of athletes. This was because the above research model could simulate the basketball starting, sprinting, and jumping repeated movement, which was basically consistent with the actual intensity of basketball training and competition. Sprinting, jumping, and fatigue producing athletes found that take off height was 75% of the initial state, and that athletes were already tired. The design and completion of the fatigue condition first ensured that the experimental personnel were sent from the initial position to the other take-off site. Athletes took off 5 times in the take-off position, and then returned to the initial starting point. During the take-off stage, the right hand needed to touch the mark. The repetition of the cycle was repeated, and the final acceptance test that athletes could not touch 75% of the original height was appropriate. Figure 3 shows a detailed schematic diagram of the fatigue model. 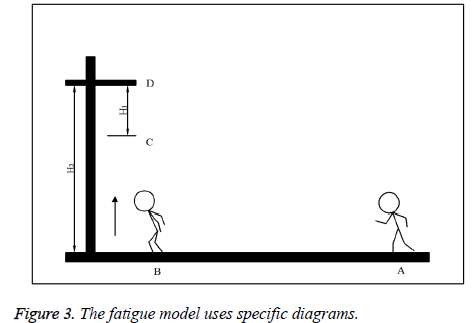 Figure 3: The fatigue model uses specific diagrams. After passing the above fatigue pre-treatment stage, the test athletes needed to do the technique of stop shot jump. Subjects were asked to move forward at the position 8 meters away from the test system. Both feet were needed to step on to test the take-off power. After the emergency take-off, double feet were placed on the test table. The players needed to dribble as fast as possible to ensure high accuracy, and as much as possible for high jump. The experimental data was collected for only 3 times. The player finished the set of three jump shot techniques. After the model was processed, three data acquisition tasks were completed repeatedly. There was a difference in the dynamics data of the lower limbs before and after the fatigue. 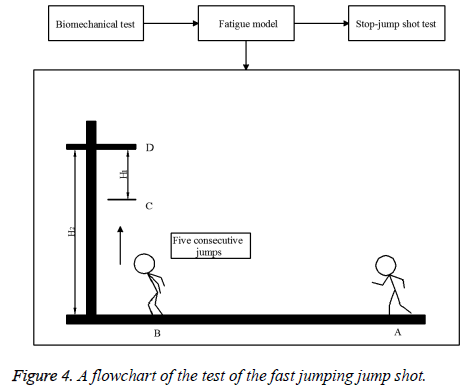 Figure 4 shows a flow chart of a test of stop jump shot technique for a basketball player before and after fatigue in this study. Figure 4: A flowchart of the test of the fast jumping jump shot. The CORTEX model was used to process the dynamic data of the athletes, and the ground reaction force was indirectly detected. The feet began to touch the ground vertically. When the force of the ground was greater than 10 N, it started. When the afterburner was less than 10 N, leave the time as the count of time. The torque of lower limb joint was deduced by inverse dynamics method. The central values of the ankle and knee were calculated by the Bell formula. The unit vector of the three directions of the hip on the right was calculated with the expression as follows. The athletes focused on lateral ankle joint. The internal and external points of the ankle were the center of the test. During exercise if taking into account the actual state, it was likely to cause the lack of the medial malleolus movement position data. After the static calibration, the local coordinate points were set up at the center of the joint, and finally a coordinate system could be converted. The axial vectors of the kinematics data of the athlete's right leg were calculated and expressed similar with Formulae 1~4. In order to calculate the static moments of the knee and hip joints, the inverse kinematic mechanical method was used. According to the order of separation, considering the distal data, the proximal joint torque was in the opposite direction to the force. 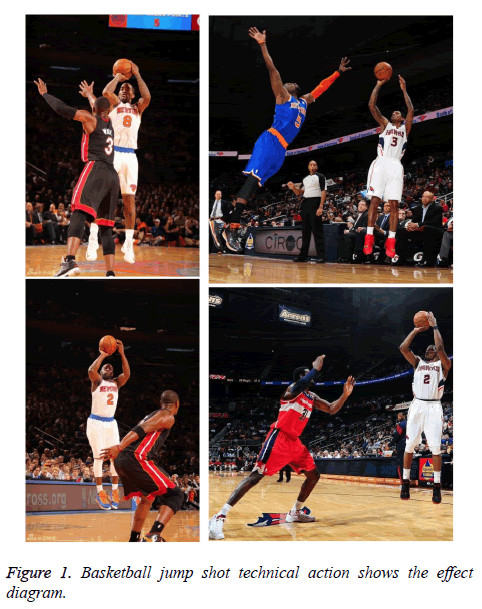 The stop jump shot of basketball players was divided into the stop stage, jump stage, aloft stage, and landing stage. The maximum bending condition of the two feet landing was the focus of the test. Figure 5 shows the dynamic parameters of each stage of a basketball player's stop jump shot technique. Figure 5: Schematic diagram of biological parameters of rapid stop jump shot. Finally, the data acquisition and the data after the model processing needed to be verified by T comparative analysis, to distinguish whether the data had significant difference (P was less than or equal to 0.05) and the software used was SPSS. When the technical action of the stop jump shot completed to contact with the ground, the joint position of the lower limb was in a bending state. After landing on both feet, the knee was slipping before fatigue. The knee joint bending angle of both sides of the basketball player in the state of rapid stop was in the trend of increasing. The bend of the ankle was in order to cushion the landing after take-off and the reaction of the ground to the body. 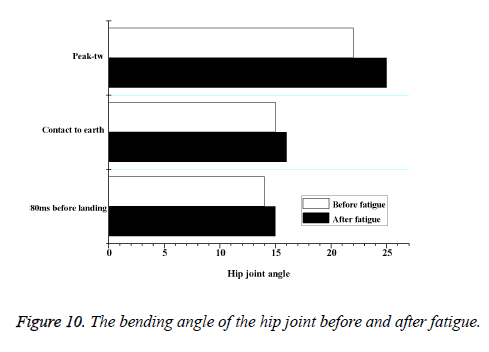 As can be seen from Figure 6, there was no significant difference in the angle of action between the hip joint and the knee joint before and after the fatigue test. This was because the ankle was deflected outward, but the outward deflection of the ankle of the athlete was increased after the fatigue test. There was no significant difference in the angle of torque between the athletes' frontal states and plane medial angles. After knee fatigue, the outward rotational moment decreased, while the ankle joint was the opposite. The internal force moment tended to decrease before fatigue test. Figure 6: The state of curvature of the joint before and after fatigue. When the athletes were in the flying stage, fatigue test of the body had a negative effect on hip joint, but there was no significant difference of knee joint. The ankle joint bended to the inside in the flying stage, and the fatigue test played a negative role (Figure 7). Figure 7: The biological parameters of the lower limbs in the empty stage before and after fatigue (n=12). The bending angles of the lower limb joints of the athletes at the 80 ms moment before landing were measured. As we could see in Figure 8, the athlete's hip was most affected by the fatigue test, and the knee joint was slightly less affected by the fatigue test, and the ankle joint also had a slight effect. The results of the test showed that when the body lost its steady state and gradually showed fatigue, it automatically balanced itself through the sagittal plane of the body. In this state, the hip and ankle joints of the lower extremity played a crucial role and the ankle played a supporting role at this time. Figure 8: The bending angle of the lower limb joint at the 80ms moment before and after the fatigue landing. At the landing stage, the impact of hip joint on fatigue test was greater, and the knee joint and ankle joint were less affected. Therefore, the fatigue test resulted in a decrease in the buffer balance ability of the athletes. When the medial torque of the hip joint, the medial torque of the knee joint and the medial force of the ankle joint were subjected to fatigue impact, the kinematic parameter values were reduced (Figure 9). Figure 9: Kinematics parameters of lower limbs at landing stage before and after fatigue. The stop jump shot techniques of basketball required the balance of the hip joint in the take-off and landing stages. Therefore, the degree of fatigue of hip joint was larger than that before fatigue. No significant difference was found in the landing stage after take-off. This showed that the hip could provide the body with pre alert state of fatigue, and the body had enough time and space to make adjustments (Figure 10). Figure 10: The bending angle of the hip joint before and after fatigue. Before the landing, the bending angle of the ankle joint of 80 ms was significantly different from that of the fatigue test. However, when both feet landed, there was no significant difference in ankle flexion. After landing, the extremum was weakened. After fatigue tests, the force of the human body on the ground decreased. If there was strong contact with the ground, it was easy to suffer from chronic sports injuries (Figure 11). 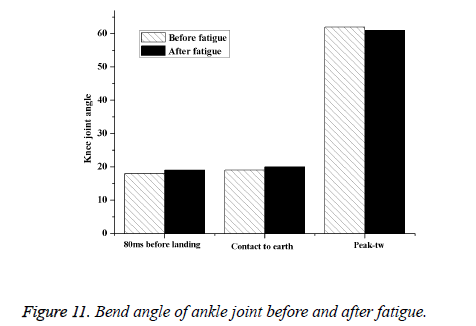 Figure 11: Bend angle of ankle joint before and after fatigue. Stop jump shot is the basic technique of basketball, and it is a basketball skill that combines basketball dribbling, turning, stopping, jumping and shooting. This technique can basically sum up all the basic skills of basketball, and it is also used by the basketball players in the arena . The stop jump shot can reflect the fatigue damage status of an athlete's field. In basketball match, shooting technique is the main means of scoring. The scoring at the crucial moment depends largely on the accuracy of the shot. Whether the jump shot technique is stable or not has played a key role in the success or failure of many basketball matches. Basketball jump shot is divided into three stages of technical action. The first stage is the take-off stage, the second stage is the flying stage, and the third stage is the stage of landing buffer . Jump shot requires take-off height as high as possible, and the faster the starting rate the better. This avoids the cover area of the defender. With the longer time, there will be the better the quality of finished shot action. The longer the stay in the air, the better the shooting rate will be. Landing on your feet, you can give your body a great deal of cushioning through your knees and ankles . Each stage of the basic technical action of jump shot needs for precise control, to improve the shooting rate and reduce the chance of injury . The concept of kinematic fatigue mainly refers to the fact that the body function of an athlete cannot maintain normal physiological needs, and exercise fatigue may cause muscle weakness. It can be seen from previous reports that exercise-induced metabolic enhancement is an inductive factor in sports fatigue. According to the research on the movement mechanism of basketball, the existing research shows that anaerobic oxidation projection provides the basic motive power source for ATP-CP system. In the actual basketball match, athletes use oxygen free energy when they play on the court, the general proportion can be close to 88%, and the aerobic system provides about 12% of the function . Anaerobic respiration, which provides athletes with a great deal of functionality, results in a great deal of lactic acid production. The pH of an athlete's body is acidic. In the course of athletic competition, the athletes are in a state of acid-base imbalance. If the athletes sweat badly on the floor, it can also cause electrolyte and water loss. With the acid-base imbalance in the body and the loss of electrolytes, muscle recovery is reduced and dysfunction, which is what we call "cramps". At this time, the level of athletes' sports is obviously decreased, and the possibility of fatigue injury is greatly increased . The general athlete's fatigue imbalance calculation model is divided into partial functional decline and overall muscle application disorder. Partial muscle weakness of the body can be detected on a dedicated isokinetic dynamometer, and isokinetic muscle force testing is performed on a dedicated isokinetic dynamometer . In the overall test, the subjects run 5 times in a row for 30 s. After arriving at the destination, they took off for 5 times, and then sprint back to the origin. After such repetition, the subjects will feel unable to complete the movements behind, which generate the so-called fatigue. Fatigue caused by sports has great influence on Athletes' physical function, mainly on the reaction of athletes' bones and muscles, and on the delayed transmission of the nervous system. Neural control of the entire muscle is affected by exercise fatigue . After fatigue, the self-control ability of the athletes decreases, and the fatigue and laxity of the knee joints are more obvious. Therefore, the sense of balance of the body is seriously decreased, and fatigue leads to great correlation between the neuromuscular controls of the athletes. Especially when a basketball player falls to the ground after take-off, the center of gravity of the body is constantly changing. At the time of landing, the yield angle of the hip joint decreases and the risk of injury is greater . The study of the hip joint for the fatigue damage of basketball is rare. Many studies have been done on the knee and ankle joints. This is because many researchers have not studied and dissected the basic structures of the hip joints . The hip joint is the most stable structural form in the joint structure of the human body. It is stable and difficult to dislocation. Figure 1 is a sketch map of a basic basketball stop shot jump shot. But the structure of the human body is an organic body of circulation and a chain of motion. After completing the basic jump shot of basketball, a closed loop movement structure must be formed. Therefore, the joint has a profound negative impact on the overall movement of athletes. When a basketball player takes off the jump shot, the maximum load on the tibia of the body is the shear stress, and the outer angle of the knee joint of the lower limb rises and the curve angle decreases. Finally, when fatigue occurs, the outreach of the joints is generally stretched outward. Therefore, these biological characteristics may be the components of damage . The literature on fatigue, kinematics, and dynamic damage shows that when athletes take off, the limiting torque of the knee joint decreases and the maximum angular rate of the joint reach a low rate. Female athletes need more control in this respect. In the process of completing the jump shot of basketball players, the common problem of fatigue injury is the ligament rupture on both sides of the ankle joint . From a biomedical point of view, the ligaments on both sides of the ankle are the weakest. Due to the relatively large range of mechanics used, relatively weak of muscle strength on both sides of the long muscle and the fatigue of athletes, the possibility of strain on both sides of the ankle is greatly increased. The range of nerves that the muscles of the body can control is based on the performance of the body. Feedback shows that the joints of the body are stable and the chances of fatigue are less likely. But it can be dangerous if it does not meet the buffering effect of protecting the joints of the body . Early studies showed ankle sprains that were caused by an excessive reflex arc in athletes. Later research results have refuted the above analysis results. In the case of dynamic instability, the pre mechanism is an important result of neural feedback. There is no consistent view about the mechanism of fatigue before landing. Therefore, we cannot completely draw a conclusion that fatigue is likely to cause the ankle joint failure . Some scholars believe that when the players do jump shot, the reaction mechanism of the peroneal muscle is inconsistent at the landing time. The posterior non-muscle does not decrease, and the posterior peroneal muscle shows decreased response. The overall movement coordination pattern produces the local disturbance, and the nerve has not enough control to the muscle. In order to ensure accurate basketball hit probability as much as possible, athletes usually increase the force to achieve the highest possible bounce height at the take-off stage, which requires a high degree of muscle elasticity for athletes. When leaving the ground, the hip and ankle bending angles of the body are not affected by the fatigue test. In addition, the force of the lower limb of the athlete is not affected by fatigue and the impact is too great. Therefore, the bending angle of knee joint is smaller than that before fatigue test. In order to obtain the maximum take-off height, the athlete needs to get the maximum initial velocity of the vertical ground, which requires the athletes to have large vertical upward explosive force. However, after fatigue test, the muscles of the subjects are affected by lactic acid, the strength of which is obviously insufficient, and the explosive force of the lower limbs drops seriously. Therefore, the distal end of the motor chain of the lower limb cannot form a significant closed loop. The initial take-off speed decreases along with the effects of fatigue, and the time is reduced accordingly. In this paper, the kinematic characteristics of the lower limb of the experimental object were studied, such as the front 80 ms of the falling contact ground and the time of contact with the ground. It was found that the bending angle of the hip joint increased, the ankle joint was smaller, and the knee joint was not affected by fatigue test. The effect of kinematic fatigue damage on the rapid stop and jump shot technique of basketball players was mainly manifested in the biomechanical characteristics of the joints of the lower limbs. At the moment of landing, gravity gave the body an obvious advantage of ankle joint, and the bending angle of the hip was weakened for compensating for knee flexion. The lower joint was subjected to a great deal of ground reaction in contact with the ground, so the hip and ankle needed a bend to supplement the rest of the offset. This paper showed that in each stage of the stop, the kinematic parameters do not change significantly before and after the fatigue test; in the take-off stage, the bending angle of the knee joint decreases because of fatigue, and the upward vertical explosive force of the body decreases; the landing stage increases the chance of injury to the medial bend of the ankle joint, which allows the body to fall on the floor, reduce the medial torque, and maintain a balance. The quality of the technical movements of the athletes after fatigue test has been analysed. However, the specific shot jump rate has not been statistically analysed, which needs to be strengthened in the follow-up research. The study was carried out in compliance with the Declaration of Helsinki of the World Medical Association, and according to a protocol approved by Medical Ethics Committee of Dalian Maritime University. The objectives of the study were explained to the study participants and verbal consent was obtained before interviewing each participant. Rafael F, Antonio da S, William F. The influence of whole-body vibration on creatine kinase activity and jumping performance in young basketball players. Res Quart Exerc Sport 2013; 84: 503-511. Plummer HA, Oliver GD. The effects of localised fatigue on upper extremity jump shot kinematics and kinetics in team handball. J Sports Sci 2017; 35: 182-188. Chavez A, Knudson D, Harter R. Activity-specific effects of fatigue protocols may influence landing kinematics: a pilot study. Int J Exerc Sci 2013; 6: 243-249. Huang YC, Chang JH. The influence of jumping performance after rectus abdominis fatigue. Bibliogr 2013; 3: 2293-2295. Yoshikawa T, Mori S, Santiesteban AJ, Sun TC, Hafstad E. The effects of muscle fatigue on bone strain. J Exp Biol 1994; 188: 217-233. Whiteside RA, Jakob RP, Wyss UP. Impact loading of articular cartilage during transplantation of osteochondral autograft. J Bone Joint Surg 2005; 87: 1285. Ewers BJ, Dvoracek-Driksna D, Orth MW. The extent of matrix damage and chondrocyte death in mechanically traumatized articular cartilage explants depends on rate of loading. J Orthop Res 2001; 19:779-784. Flynn JM, Holmes JD, Andrews DM. The effect of localized leg muscle fatigue on tibial impact acceleration. Clin Biomech (Bristol, Avon) 2004; 19: 726-732. Madigan ML, Pidcoe PE. Changes in landing biomechanics during a fatiguing landing activity. J Electromyograph Kinesiol 2003; 13: 491-498. Moran KA, Marshall BM. Effect of fatigue on tibial impact accelerations and knee kinematics in drop jumps. Med Sci Sports Exerc 2006; 38: 1836-1842. Pliauga V, Kamandulis S, Jaszczanin J. The effect of a simulated basketball game on players sprint and jump performance, temperature and muscle damage. J Human Kinetics 2015; 46: 167-175. Mcginnis RS, Cain SM, Davidson SP. Quantifying the effects of load carriage and fatigue under load on sacral kinematics during countermovement vertical jump with IMU-based method. Sports Eng 2016; 19: 1-14. Mota JA, Stock MS, Carrillo EC. Influence of hamstring fatigue on the estimated percentage of fast-twitch muscle fibers for the vastus lateralis. J Strength Condition Res 2015; 29: 1. Huis VR, Van d HC, Maartens E. The influence of sport-specific fatigue on neuromuscular activation and joint angles in ACL reconstructed knees: 1293 Board #5 June 2, 8: 00 AM-10: 00 AM. Med Sci Sports Exerc 2016; 48: 336. Zych J, Wrobel J. Influence of the selected factors on thermal fatigue of the ADI in an aspect of its suitability as the material for metal moulds. Arc Metall Mater 2014; 59: 693-697. Kim TH, Youm CH. Effects of knee joint muscle fatigue and overweight on shock absorption during single-leg landing of adult women. Kor J Sport Biomech 2014; 24: 59-66. Okazaki VA, Lamas L, Okazaki FA. The effect of distance increase on basketball shot performed by children. Motricidade 2013; 9: 61-72. Ghasemi M, Bagheri H, Olyaei G, Talebian S, Shadmehr A. Effects of cyclic static stretch on fatigue recovery of triceps surae in female basketball players. Biol Sport 2013; 30: 97-102. Gentle HL, Love TD, Howe AS. A randomised trial of pre-exercise meal composition on performance and muscle damage in well-trained basketball players. J Int Soc Sports Nutr 2014; 11: 33. Dehnavi H. The effect of fatigue on functional stability in the basketball players with functional ankle instability. Am J Sport Sci 2014; 1: 28. Zhu Y. Correlation study of self-suggestion on recovery of basketball players fatigue. Bull Sport Sci Technol 2014; 27: 619-623. Cordova A, Seco JA, Mielgo-Ayuso J. Effect of the immunomodulator (AM3®) on biochemical muscular damage markers in basketball players. Biol Exerc 2016; 12: 1-13. Chen Y. Comparative analysis of the plyometric training and dynamic tensile on the influence of male basketball players vertical jump and agility. J Converg Info Technol 2013; 8: 1084-1091. Aerts I, Cumps E, Verhagen E. The effect of a 3-month prevention program on the jump-landing technique in basketball: a randomized controlled trial. J Sport Rehab 2015; 24: 21-30.